Do you remember playing Battleships as a kid when you was growing up in the early 70’s, 80’s and even 90’s? Remember saying “Hey, you sank my battleship” to the person, friend or family member you was playing when they did? Well with the Battleships Slot Machine game you can relive that whole experience all over again. Only this time, you will have a lot more fun and possibly win big for it! Thanks mainly due to the Internet and online casinos, the great game of Battleship has been turned into a casino game that you can play at a real casino or online. With 25 win lines and two bonus rounds to enter on every spin of the reels, plus with tons of wild symbols to get, playing Battleship slot machine game is fun and exciting! You can indeed rack up some really big wins by lining up the wild symbols. Some of the multiple wins that come in can bag you up to 125,000 credits! Although that’s only if you’re playing with the maximum bet allowed. What I like about Battleships Slot Machine game is that it has a bonus round called Pick Your Battle game. In this bonus round you’ll need to get three matching bonus symbols on reels 1, 2 & 3. When you get them you can choose which of these bonuses to play. If you want, you can play the winning encounter bonus. But you can choose the sink the fleet bonus too. What is the sink the fleet bonus? If you remember in the original Battleship game, you need to work our and guess where to fire at the enemy warships on the grid. You can do that when you have 16,100 credits by playing the maximum bet allowed if and only if you successfully manage to sink all of the enemies fleet battleships. As for the winning encounter bonus, this is a ship-to-ship battle that can bag you a 5x multiplier. These are free spins that will keep going until the enemies ship is sunk. But it also lasts only up to 100 spins as well which I have found. Basically whichever happens first. But you would probably sink all their ships with that many bonus spins. 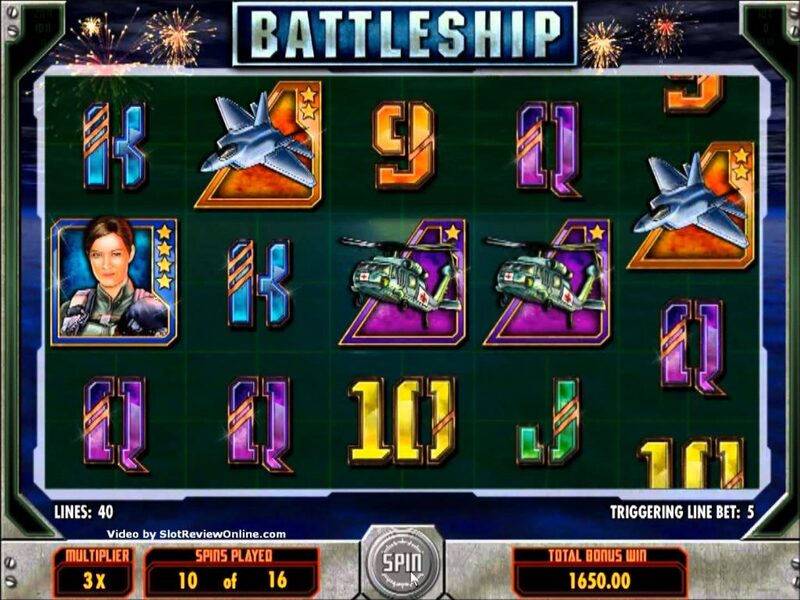 The Battleships Slot Machine game has been about for a while now. You can find it in some pubs and clubs and most good casinos today. As well as those online casinos too. The game itself has amazing, very engaging graphics and sounds which are very visceral and it really puts you into the game to enjoy the whole Battleships experience. If you used to play the original Battleships game as a child, you’ll love the step up this game can have and it’ll spark nostalgic feelings and be a joy to play. That goes for whether you win or not! Obviously, if you walk away down, that’s not good. But provided you only gambled with what you were happy to lose. Well, at least you would have still got to experience the thrill and buzz and excitement (not to mention nostalgia of playing the Battleship Slot Machine game! Have you ever played it yourself? What’s your verdict and review for this great slot game?